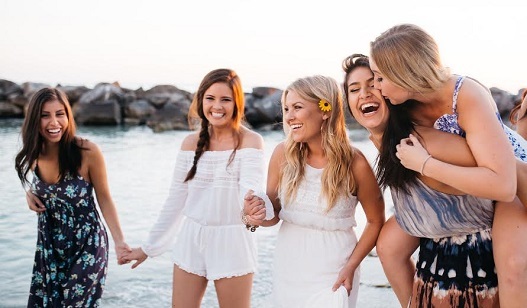 Alpha Delta Pi Sorority encourages the proactive recruitment of Alumnae Initiates who exemplify the high ideals upon which our sisterhood is based. Membership is a lifetime commitment and an honor to be conferred with careful consideration of its requirements and responsibilities. Alumnae Initiates are members of Alpha Delta Pi with all the rights, responsibilities and privileges thereof. Alumnae Initiates must be willing to acquire knowledge of the sorority and its procedures; they must be willing to give time to the sorority so that their membership may be meaningful; they must have demonstrated an interest in college females and given service in community affairs. They are eligible for membership in any alumnae association; they may also be involved with collegiate chapters serving in various capacities such as advisors or house corporation officers; or they may serve as international officers. The candidate has never been initiated into any other inter/national Greek letter social organizations (including NPC, NPHC, NIC groups). Prior attendance at a college or university is preferred; however, graduation is not a requirement. Professional work experience may be considered as a substitute for education in some cases. She is typically age 25 or older and no longer enrolled as an undergraduate at a college or university. Or in a colonization opportunity. She must be willing to acquire knowledge of the sorority and its procedures. She must demonstrate an interest in working with and supporting a chapter and/or alumnae association and the sorority in general. She must have demonstrated her interest in college females and given service in community affairs. Three individual alumnae in good standing, including a recommendation letter from each alumna. With the privileges of membership in Alpha Delta Pi come certain responsibilities which should not be taken lightly but should be given full consideration and understanding. Academic: Alpha Delta Pi expects each of its members will be committed to high academic standards and will exemplify that commitment through academic excellence. Social and Ethical Standards: Alpha Delta Pi chooses females of high moral standing and character for its members. The principles of good behavior and respect for one another and ourselves are principles which are never out of date. Personal Development: Each member is encouraged and expected to develop to her fullest potential by taking advantage of opportunities surrounding her. Total Membership Education workshops are designed to assist each member in personal growth and development and give each member a sense of pride in membership. Commitment: Alpha Delta Pi cannot survive without the support and commitment of its members. Commitment is putting action into our beliefs and living out our principles. Never was a dream achieved, nor a goal reached, without commitment. For Alpha Delta Pi to be successful, every member must be committed to being an earnest, faithful and enthusiastic worker for the advancement of our sorority. To the community in which we live, as good citizens, participating in community affairs and obeying the laws established by our fellow citizens. An Alumnae Initiate must pay an initiation fee as set by Grand Council, consistent with collegiate initiation fees, and purchase a badge and guard through Executive Office.